Yes, I’m jumping on this bandwagon…weeeee! 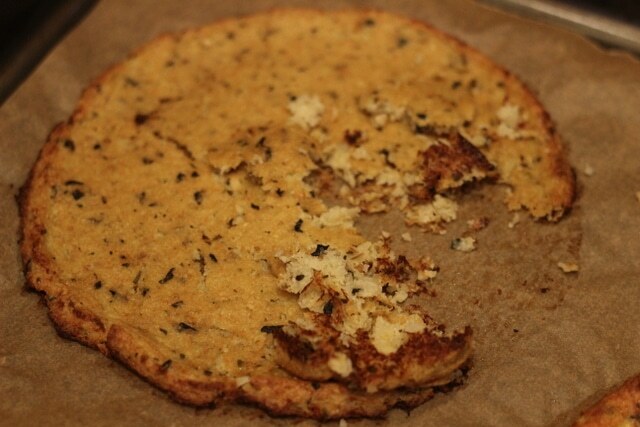 ….so I created my Zucchini Pizza Crust. After many trials, fails, and stinky dish towels, I’ve finally perfected my own pie that…. Make your cauliflower rice by either grating the pieces using a cheese grater or pulsing the florets in a food processor until finely chopped. Once boiling, add the cauliflower rice to the pan. Turn the heat off (leave the pan on the burner), and cover the pan. Let the pan sit covered for 10 minutes. Remove the lid from the 'rice', and dump the contents into a fine-mesh sieve to drain a bit. Transfer the cooked cauliflower from the sieve to a clean dish towel. Wrap the cauliflower in the towel, and squeeze out the excess water (there will be quite a bit!). In a bowl, mix the egg, oil, and remaining ingredients. 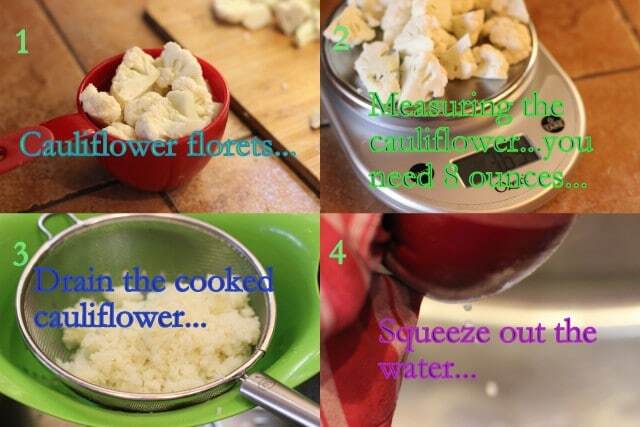 Add in the squeezed cauliflower. 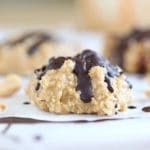 Pour the contents of the bowl onto a parchment paper-lined cookie sheet. 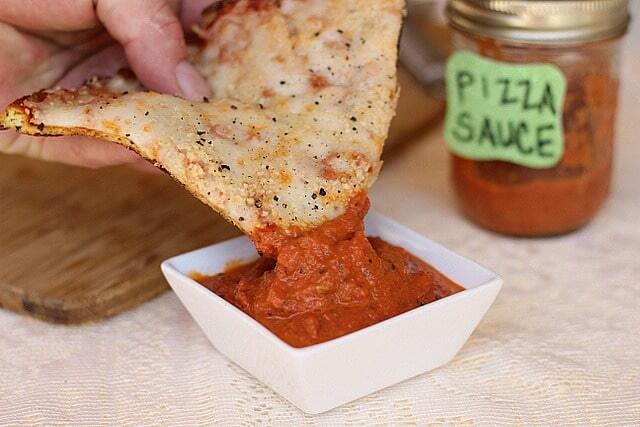 Using a spoon, spread the mixture out into the shape of a small, round pizza (it should be about 1/3 of an inch thick). You can also use your spoon to create a little crust, if you like. Place the pan into the oven, and bake the pizza for 40 minutes. Remove the pizza, and increase your oven temperature to 450 degrees. Top the pizza as you desire. Once the oven has heated up, replace the pizza, and bake for 6-7 more minutes until toppings have cooked through. Remove the pizza, cool, and enjoy! I found that one cup of chopped cauliflower is equal to about 3.6 ounces. I used this food scale (which I love) for my measurements. If you’re an avid cook/baker, this comes in very handy. When spreading the mixture onto the parchment paper, don’t be alarmed if it appears too wet. Also, when spreading the mixture onto the parchment paper, be sure to cover any holes and that you don’t see the paper showing through. If you double the recipe, double all of the ingredients EXCEPT only add in an additional egg white instead of another whole egg. This is just perfect for one hungry, pizza-loving girl person. Vegans, I tried really hard to make this without the egg, but could not do it…. I imagine you’d need starches and/or gums, which my tummy cannot handle. 🙁 If I have any luck in the future, I will post it! 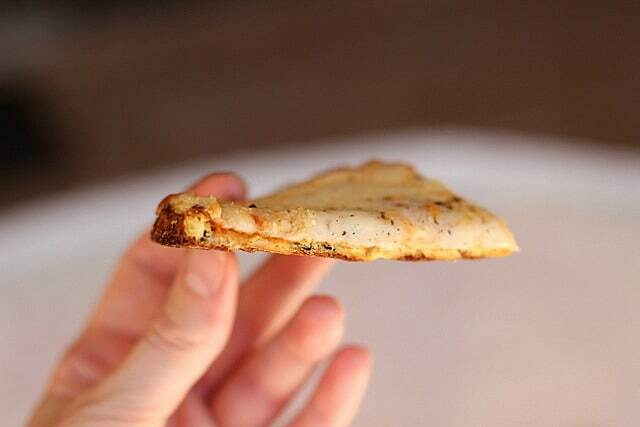 What’s the best pizza crust you’ve ever tried? 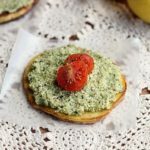 Can I sub almond flour for the nutritional yeast almond meal? So amazing! I topped it with Feta, Spianch, Chickpeas, Red Onion, and Tomatoes with Spicy Hummus as the base. It did not crumple and tasted great! I added a pinch of Italian seasoning and sprinkled red wine vinegar on top of the toppings. Even my dad and Mom who frown upon “healthy food” loved it! Thanks Kat, so happy you enjoyed it! Your version sounds terrific! Did you use a dairy free cheese on this? If so what kind? Nope, I use the real deal on top. I’ve heard Daiya is a good vegan alternative though! What diameter should the crust be? Would it work putting it in a 9″cake pan like your quinoa crust recipe? Thank-you for your response 🙂 The pan I used was a 9 inch pie pan, which turned out to be too big and the crust was really thin. It shrunk while baking and I had to take it out after 30 minutes because it was getting very brown. Still tasted fairly good, though! How did you get yours in such a perfectly round shape with the lip like that? It looks fantastic! Thank you! Thank you! Thank you! I’m on WW and this fit in perfectly! It was great and held together wonderfully! This looks like a great no-cheese version. Trying it tonight for sure. Thanks for the nutritional info too! So far I’ve only made cauliflower crusts with cheese b/c I thought it was needed texture & flavor. I’m trying this recipe tonight. I really need a great no-cheese recipe for a friend who can’t have cheese (or gluten!). I have almond flour so I’ll use that. Having the nutritional info is also a GREAT help…so thanks for that too! Now I’m imagining a bacon-weave layer underneath for support (for those who aren’t vegan/vegetarian). I’m not. I just love all vegetables AND saving carbs wherever I can. Yum! I made this tonight and was a little nervous, but it was delicious! I don’t think I added enough cauliflower or maybe not enough nutritional yeast as it was a little eggy tasting. I’ll adjust this next time. The recipe was easy and made a great tasting pizza! This recipe looks fantastic. Have you ever tried making it ahead of time and freezing it? Sorry for the delay, I haven’t tried freezing it, so I’m not certain, sorry! Hello! I tried this, however mine got stuck to the parchment paper and wouldn’t come off 🙁 Any ideas what I did wrong? The first two things that come to mind are 1) are you sure you used parchment and not wax paper?, and 2) did you leave the oil out? I’ve not had that trouble, so I can’t say for certain. You can always oil the parchment a bit to prevent sticking if you try again! Wow I’m embarrassed… I used wax paper not parchment paper! I will try again with parchment paper! 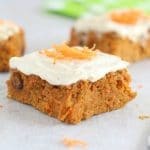 Does egg replacement work in this recipe? I haven’t had luck with it in my zucchini pizza crust recipe, but I haven’t tried here. Can the oil be ommited? If it can, does it have to be substituted by something else? I replaced the oil with applesauce and used only 1 egg white, came out perfect! Awesome Chris, thanks for the feedback! Does the t. in the ingredient list stand for teaspoon or tablespoon? Hi! I made this recipe for dinner today! I was pleasantly surprised, I have not made any cauliflower crusts before, for the same reasons as you, this was perfect! I could pick it up and tasted great. Thank you! I don’t think I’ll ever use another recipe. Hi! This looks amazing, I can’t wait to try it! I was wondering if the 200 calories were for the whole pizza or just one slice? Your ingredients list 1/2 cup of water but the step-by-step only asks for 3 tbsp of water to be boiled. Does the remaining water go in with the “remaining ingredients” in Step 10?? This seems too watery. Sorry for the confusion Marlene, the correct amount of water is 1/2 cup and you just squeeze out the excess, as the remaining instructions state. The recipe has been updated! Did you try to replace the eggs with applesauce? I’ve done that in other recipes and it has worked well. I just made this recipe for my mother and for dinner. Turned out amazing! 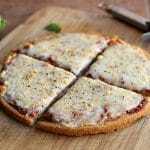 I am so happy I found a healthy and tasty alternative to regular pizza. Hi Lauren! 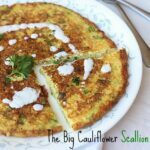 I came across this recipe for a vegan cauliflower pizza! I haven’t tried it out yet but the technique seams unorthidox enough that I have high hopes that it actually works! Hey there I do not have a scale how many cups of grated cauliflower do I need? 1? Hey, you had mentioned your stomach doen’t do well with the gums, have you ever tried using psyllium husk? i love it, i bake with it alll the time…. If I doubled the recipe accordingly do you think the cauliflower crust could be frozen and used another time? If so do you suggest baking it first then freezing, or freezing it after shaping the crust? Thank you for the recipe!! It is perfection!! I have been looking for a cheese free option for so long!! 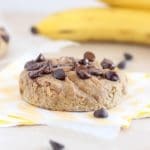 Would flax seed meal work instead of the almond meal? I use applesauce instead of egg. I going to try this this week-end… Lookds yummy!!! Looks delicious! 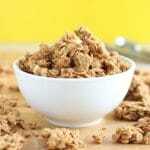 What purpose does the 1.5 t of almond meal/yeast/oats/or cheese serve? Trying to figure if I can leave it out or a reasonable substitute. My littlest is on the AI protocol and just recently introduced eggs back in and would love pizza, but can’t have any of the above ingredients. Thanks in advance! The bit of dry ingredient soaks up some of the moisture from the egg and the cauliflower. Is there anything you can substitute? Rice flour maybe? I haven’t tried it with anything other than the mentioned, but it may be worth a shot, as it is such a small amount. I teach a cooking class for 3-5 year olds and am thinking of making this for class this week. Question, can the cauliflower rice sit in the fridge overnight and do you think it’s possible to bake the crust the night before? Trying to figure out logistics for the 1.5hr class. Pizza looks delicious. 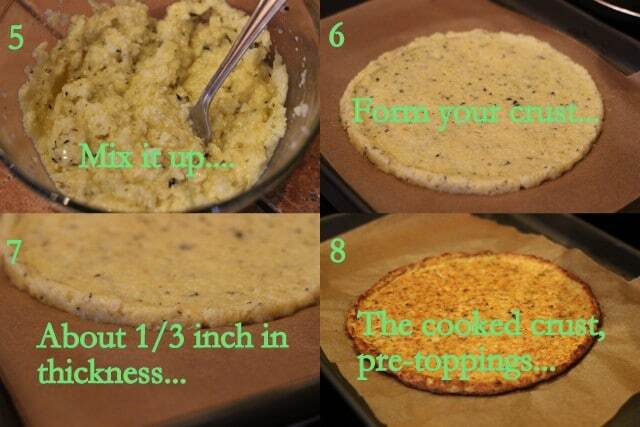 Great step by step pictures for draining the cauliflower and then shaping into that perfect pizza shape! 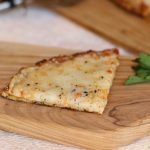 If anyone else came here for a vegan cauliflower crust, this pizza crust looks pretty amazing but I’m going to try this recipe with a flax-seed egg replacer (1 tbsp flax to 3 tbsp water) or chia seed gel (water mixed with a few tbsp of chia seeds). Hopefully that should hold the crust together somewhat…If that doesn’t work I’ll probably add in some chickpea flour or cornmeal so the flax has something to bind to. Can’t wait to make this pizza crust this weekend! Just tried this….. Holy hell it was good!!! GOD BLESS YOU! For coming up with this recipe!!! I cannot wait to make it for my hubby and friends! I’m not sure, as I’ve never tried it that way, but the amount is so minute that it might! You may want to try applesauce or water in place of it though. 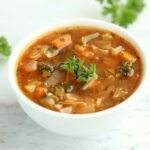 I was very technical with this recipe, in that I measured everything multiple times to get it the right consistency, so beware of it NOT working. What a great recipe! The crust was perfect! I made small “pizza rounds” cooked them and froze them for later. Thanks for the great recipe! Wow Wow Wow. Thanks for sharing the recipe. Can’t wait to try it. PERFECT!….Question…what kind of cheese/herb concoction did you top this personal pizza with…and in what quantities?…I want to absolutely replicate this recipe…as the ratio of crust to topping is just what I look for! New follower and so very impressed by your attention to concise directions, exquisite photography and creative culinary wizardry…impressed! Thank you Donna! 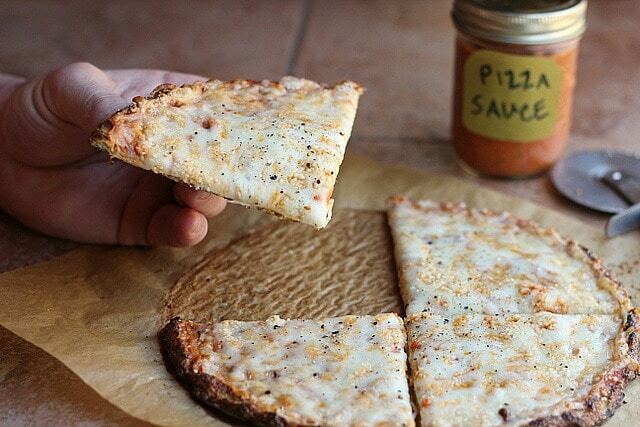 I used my Easy and Healthy Pizza Sauce (https://www.oatmealwithafork.com/2013/06/07/easy-and-healthy-homemade-pizza-sauce/), topped with a handful of Trader Joe’s light mozzzarella cheese and about a tablespoon of grated parmesan on top of that. Once it came out, I just ground a bit of fresh black pepper over the top. I hope you enjoy it! Made it vegan using Ener-g egg replacer and it worked out fine. Slightly crumbly but more or less held together. Most importantly it tasted great! Thanks. Oh, okay. It is cheese on top of the pizza. Looks yummy. About a year ago I also experimented with the cauliflower pizza crust – like you I’d seen it but always with cheese in the crust. Detoxinista had a version on her site that only called for a tiny amount of goat’s cheese, such a small amount that I had to try it without and was so happy it turned out to be so delicious. My son is so happy that we can have pizza again. 🙂 I love that you have formulated a personal pan version! You rock, girl. LOVE this recipe. Thank you for all your hard work and experimentation. I look forward to trying very soon. This look fantastic! Thanks so much for sharing! I’m curious what you put on top of your pizza in these pictures. It looks suspiciously like cheese but after all that effort to make a cheese-free crust, I’m guessing it’s not. 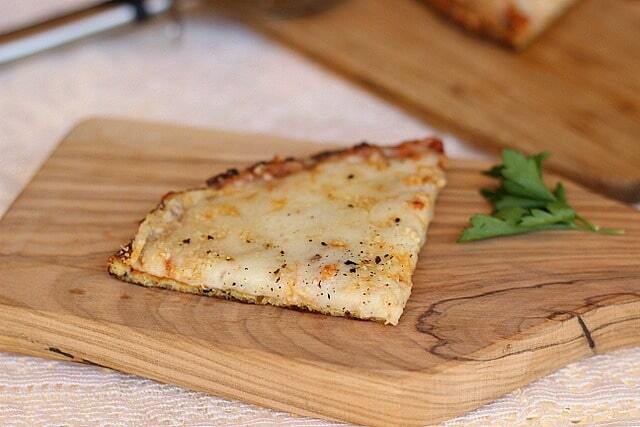 Ok, now seeing your pics I will have to try a cauliflower pizza crust! 🙂 It looks way to much like the real thing. YES!!!! Pinning this! Finally a recipe for Cauliflower Pizza with NO CHEESE!!!!!! WAHOOOOOO!!!! This looks so good and I love that it doesn’t have dairy. Try Chia Seeds with the flax. Let the mixture sit for a bit before forming so the chia seeds can “gel.” That might help with the binding! Do you think using a flax egg in place of the egg would work? I tried it, and it didn’t. 🙁 If you have success with something, let me know! That looks divine nice work! I wonder if a flax or chia egg would work I thinking it would! One egg equals 1 tablespoon ground flax or chia with 3 tablespoons water. If I give it a try I will let you know! Thanks Nicole! I actually tried that, and it didn’t work. 🙁 If you have success with it, let me know! Yay for success!! I use egg whites in my crust, instead of an entire egg. I wonder if that makes the difference in it holding together when you pick it up? Looks delicious, Lauren!! THIS!!! I was going to ask about the egg because my IgG profile said I’m allergic and my naturopath has me off them at least until July 🙁 I’m really holding out for not having to avoid them because I want to make this!!!! Try duck eggs if u can. My husband has an egg allergy but he can still have duck eggs just not chicken. Hey I love that you did this. I’ve not liked any cauli crust I’ve tried, because they’ve all fallen apart. Can I offer one suggestion? Instead of saying 8 ounces in the ingredient list (meaning volume) and then saying 3.6 ounces in the pics (meaning weight) you might want to say 1 cup (3.6 ounces) in the ingredient list. I totally thought you meant 8 ounces by weight until I saw the photos. Mmm cauliflower pizza crust rocks! I’ve heard of some people having spectacularly bad experiences with some recipes but the one I used (I can’t remember which blog I got it from) turned out really well and yours looks phenomenal too! Seeing as I’ve now forgotten which blog I got that one from, this will have to be my new go-to…! This is so unique, must give it a try even if just to satisfy my curiousity. 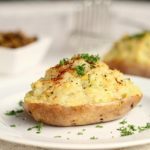 Thanks for all the wonderful recipes that you have been posting. I love this!! I must try it. We only have frozen cauliflower where I live. Will this recipe work with that? I look forward to reading all your posts. 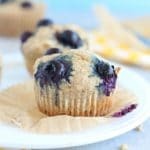 Such great ideas and recipes! Please check out my new blog and spread the word! Ok i just got around to making this. I used frozen cauliflower, defrosted etc. It worked out really well. I topped it with homemade pesto, veggies and a sprinkle of mozzarella cheese.